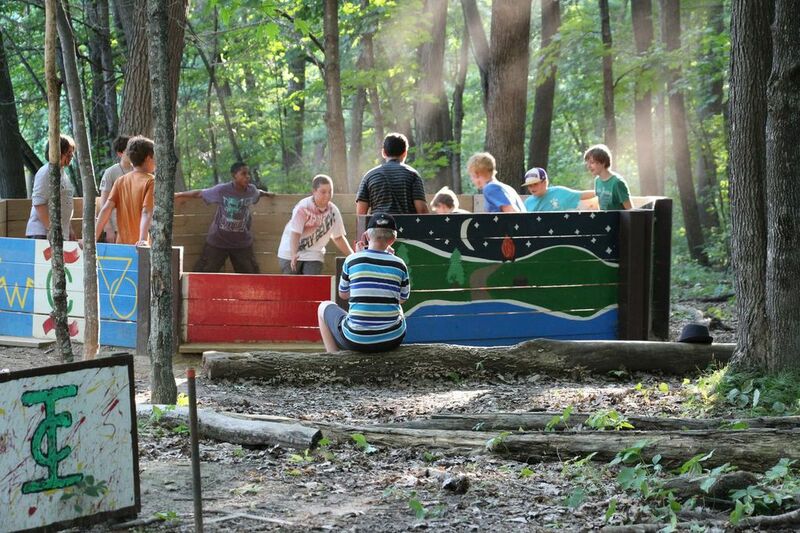 If team building is a goal of your event, conference or retreat, Camp Icaghowan has the skills and equipment to help. Whether yours is a business group, school or spiritual organization, let us help you design a program that will challenge your group and bring them together in exciting new ways. Our challenge courses foster team building, problem solving, decision-making, cooperation and communication. Call us at 715-386-1380 or 651-436-8428 or e-mail us, and we will help you design a program that meets your group’s unique goals. Participants climb solo or in twos. Climbers go as far as they can while being supported by the rest of the group. 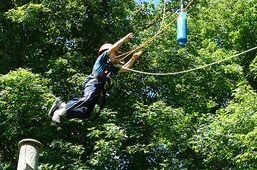 The Leap of Faith Pole challenges individuals to set goals and build self-confidence as they climb. Climbers will attempt to stand on the top of the pole and leap off, in hopes of reaching the hanging buoy. The Giant’s Ladder is a “giant ladder”—anchored at the top but loose at the bottom. Participants climb in pairs and challenge themselves to climb as far as they can. Climbers must cooperate, support each other and trust their partners. Our staff will help you foster teambuilding through recreational activities, such as swimming, canoeing and target sports.